Seen on 20090103 at the beautiful Cinémathèque de Tanger, Morocco. I loved this movie and I hope that European audiences have the possibility to see it in their countries. 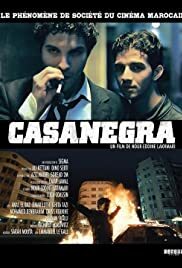 It is a sad comedy about two boys from Casablanca, Morocco, struggling to be great mobsters and at the same time dealing with everyday problems, namely violent fathers and love deceptions. The movie is very stylish. The credit sequence, showing different corners of the streets of Casablanca, is amazing, and made me feel like visiting that city, which I skipped during my travel through Morocco. The two main characters are portrayed by two excellent actors that I believe have a bright future in Moroccan cinema. I do not know if they are proficient in French and/or English, but I hope so, because they deserve a big European production to show their value. I think their look, not to mention their acting quality, should help them make it into some sets in France, for instance. Their outfit in this movie should help as well. I particularly liked the tie and suit of the guy with the hair locks (inspired by Reservoir Dogs? Who knows?). Also, many characters in Casanegra are particularly good. I will only mention the small kid-crooks selling cigarettes and the turtle guy (great!). The bearded mobster is great as well, but after a while I grew tired of his way of speaking and overacting. All in all this is a great movie, but I have to complain at least about its length, which is exaggerate. After such a lengthy movie (the second half is especially cumbersome and full of useless scenes and dialog), one would expect a flamboyant finale, but the conclusion is not. It is in fact completely acceptable, but one would expect more.